Life experiences inspire me to write. What I see and hear inspires me to tell the stories especially on behalf of those who cannot tell it themselves. I don’t. The characters really dictate the writing style. I am currently working on a compilation of contemporary short stories. I also have another historical fiction down the line. - Do you see writing as an alternate career or will it remain part-time? I would have said yes, except I have another line of work (separate from my 9- 5). I run a home décor and personalized favors company, Eclectic Goodies, a business I started about two years ago. I see myself juggling my writing and home décor interior design for the foreseeable future. I always have an outline of what I’m about to write. I have a broad outline of the novel, but for every time I sit down to write, I make a mini one for the section I’m working on. My career impacts me in terms of managing my time. I have to carve out the time to write. The positive side to that is when I get down to writing, I make the most of it. I work with numbers and that requires drilling down to the ‘nth’ figure. I find myself being as detailed as possible and this trickles down to my writing. I find myself doing research on the most seemingly mundane issues which often times bring surprising findings. - This is your first novel. Tell us what inspired it, and details about how you got published. My family loves to tell stories, particularly my grandparents. I would sit for hours listening to them tell stories about where and how they grew up, their families and challenges. My grandmother’s story about her grandmother’s flight from war-torn Dahomey was one of the many stories that stayed with me even after she passed away. I was inspired by her will to survive. It inspired me personally because it proved that anyone of us can overcome challenges, no matter how difficult they are. The events that occurred in the heroine’s (Amelia) life are a mixture of true events and fiction. I began my research and writing seven years ago. It took about three years to finish my first draft. Knowing it was historical fiction, I needed to do more research and sought out Beninoise who could assist with more research. It was a labor of love on their part. I learned so much along the way. I had two more drafts after that prior to self-publishing. Realizing that not every character in a story is relevant. They may need to be removed. This to a writer may feel like actually killing off a real person. It’s hard but it’s what may make the storyline stronger. I began writing when I was nine/ten years old. I always loved reading so it felt natural transitioning into writing. It was a way of expressing myself and it also felt comfortable. I always considered myself a writer even when it was only my sister who read my stories. The Bible is one of the first books I was introduced to. There are a plethora of stories in there that I remembered reading growing up, I acted out some of those stories and it is still one of the greatest, if not the greatest influence of my life. Another which has impacted me greatly is The Beautyful Ones are not Yet Born by Ayi Kwei Armah. He wrote about corruption in such a skillful manner that even at the age of fourteen/fifteen, I recognized how it can easily and quickly change even the best of all men if you don’t guard yourself against it. Wole Soyinka, Chinua Achebe and Ayi Kwei Armah. They all have their own unique writing styles but what makes them stand out is their abiity to get their message across in such effortless ways. Chinua Achebe. If you like Things Fall Apart, you will probably enjoy Thread of Gold Beads. 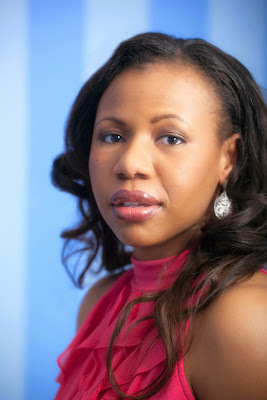 Lola Shoneyin, author of Baba Segi’s Wives, I loved the way she spun the story of deceit and the fight to survive in a polygamous household. I am presently reading Sefi Atta’s A Bit of Difference. - In what ways is the book being promoted? It’s been eleven months since the book launch and it’s been a whirlwind of book, presentations, interviews and book tours. Thread of Gold Beads is presently on a virtual book tour. She (yes, the book is a ‘she’) just finished a historical fiction virtual tour. I also just attended the Baltimore Book festival which was incredible and a great experience. She is also now at okadabooks.com. Just download on any android phone to read. - Any plans to publish the book in Nigeria? What do you think of the Nigerian publishing industry? Yes. 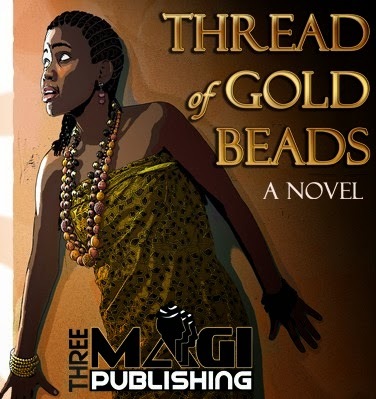 Thread of Gold Beads will be coming out this month in Nigeria, by the self-publishing arm of Parressia Books. I feel the Nigerian publishing industry has grown in leaps and bounds. I’m proud of the progress. It can always improve and I say this not just for the reading culture in Nigeria but everywhere else. There are so many distractions so I applaud anyone that can pick up a book and complete it. With the likes of Okada books coming up with the books on the phone, it’s an ingenious way to encourage and foster reading. I encourage you to never give up on what you’re passionate about, keep working towards it. Live your best life.